Wow, it’s been three years. 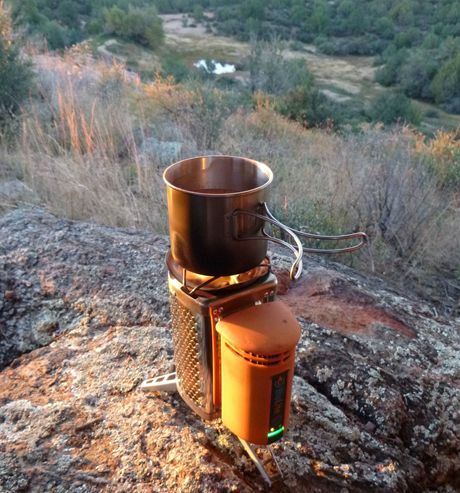 In the September 2014 club newsletter, I wrote a gear review on the BioLite Camp Stove. If you don’t remember that, you can go to the Articles section of our website to review the story. But let me give a very quick recap here anyways. 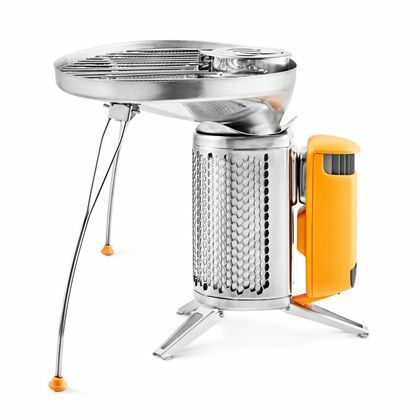 The original BioLite Camp Stove is a small wood burning stove that includes an electronic self-charging fan module. The fan injects air into the burn chamber through a series of holes located around the inside wall of the burn chamber. This air injection, “gasifies” the wood smoke, grabbing it and recirculating it back into the burn chamber, where it is ignited, resulting in very low smoke emissions from the stove. Small chunks of wood or twigs that can be gathered from the ground around you is its fuel. The fan module recharges itself through the use of a thermo-electric generator or Seebeck device. This device uses the difference in temperature between the burn chamber and the cooler air that is being drawn by the fan from the outside to create an electric current. This generated electricity is used to recharge the fan battery inside the electronics module, and any extra electricity that is generated can be used to top off the charge on any USB chargeable device such as a smart phone. There’s a lot of magic going on with this high-tech camping stove. Unfortunately, all that magic is a little pricey, around $130. About a year ago, BioLite introduced a new, cost-reduced version called the Cook Stove. Designed to hit an MSRP under $100, I recently found the Cook Stove on Amazon for only $40! Holy smokes, I couldn’t resist hitting the “Buy it now” button. So what’s the difference? The Cook Stove does away with the self-charging feature. There is no thermo-electric device which makes the electronics module a whole lot simpler. There is only a fan, a battery, and the electronic control board. As a result, you have to charge the module yourself through a USB charging port on the bottom of the module. The Cook Stove cannot charge your smart phone or anything else. An improvement in the Cook Stove over the original is that there are now four fan speeds instead of just two. But the original has now been redesigned for 4 speeds as well. Another improvement is that the fan is much quieter at all speeds than my original. One of the reasons that I like the BioLite stove is because it’s essentially a small portable camp fire. I envisioned having a nice little warming fire on those cold early mornings sitting in a deer blind. The first time I tried that, I was annoyed at the fan noise of my Camp Stove. From a short distance away, you (and game) can’t hear it, but still the sound was disconcerting. But the hot chocolate that I brewed sure was welcome! Though the Cook Stove is still the same overall size to pack as the Camp Stove, it’s about 8 ounces lighter due to the simplified electronics. Lighter and quieter to operate - that makes the Cook Stove a better solution for the deer blind, and more likely to actually make it into my hunting pack. Recharging at camp won’t be a problem with my solar powered camping trailer, or even in the field with a small packable soft solar panel, or a USB battery. The lack of self-charging is not really an issue for me. BioLite claims that a full charge will run the fan for about 30 hours, so recharging after every burn is not required. There is a four-LED battery meter to tell you the state of charge. When you are down to only one LED lit, you still have about 2 hours of run time remaining. When camping, I’m all about simple meals. Dinner staples are hamburgers, hot dogs, and chili out of the can. While the chili can be warmed directly on a BioLite stove, the other two are best prepared on a grill. 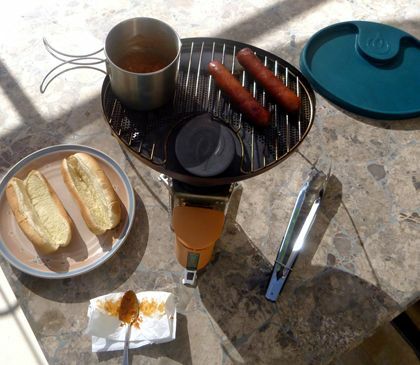 BioLite offers a nifty grill attachment that works pretty darn well. It sits on top of the fire hole to channel heat and flame to the grilling surface. Two wire legs fold down to support the grill. There is a metal door over the fire hole to allow the stove to be fed with fresh fuel as you cook. Closing the door directs the flame to the food on the grill. Between the fire hole and the grilling surface is a perforated metal heat spreader to even-out the heat under the grill that the food sits on. But the greater heat will still be the area closest to the fire hole. If you don’t move the food around, the side closer to the fire hole will overcook. You have to keep an eye on the food, rotating and shifting so it cooks evenly. cover for transport, doubles as a plate or cutting board. The neat thing about grilling on the BioLite is that you get that great wood smoked flavor that you just don’t get from a propane or gas fuel source. Lately, Ben and I have been scrounging mesquite and juniper branches whenever we can find them, and processing them down to BioLite sized chunks for cooking. Even though we have a standard backyard propane grill, since getting the grill for the BioLite, this has become my go-to first choice for grilling dogs and burgers. It will hold three burgers or six dogs to feed three people. If I need to feed more, then I will have to fire up the big grill. The grill is probably more than you want to take along in your pack. That’s not to say that you couldn’t – a determined backpacker could certainly add it to his pack. 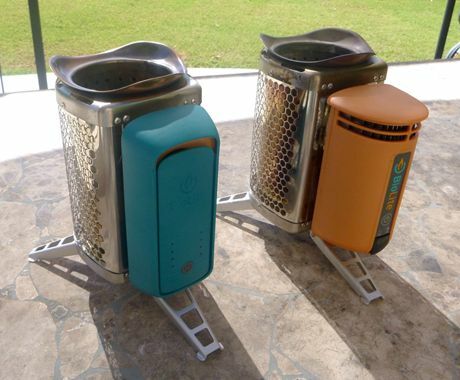 But most backpackers would not consider packing the BioLite stove and grill due to weight. The BioLite grill system is eminently suitable for car camping though. When I first tried cooking burgers on the grill, results were not so good. In my last story, I told how the little stove is a voracious consumer of twigs and other small pieces of wood. You just have to keep feeding it almost constantly. If you neglect it for just 5 minutes, you will lose the flame. Then when you feed fresh wood into it on top of the burning embers, it will billow smoke until the new wood catches flame again. Because constant babysitting of the flame can be difficult, cooking burgers evenly was quite a challenge. I was ending up with black outsides and raw insides. 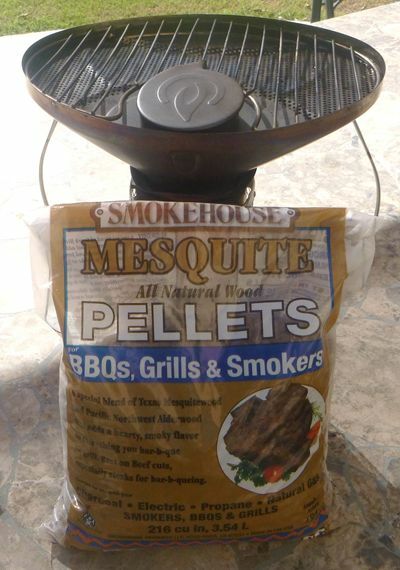 I gave up on grilling burgers until I discovered how much the BioLite loves wood pellets. The pellets are cheaper per pound in larger bags, but a small 5 pound bag costs only about $6 and feeds a BioLite for many burns. I start by filling the burn chamber about half-way full with pellets. Then I place a loosely twisted paper napkin on top of the pellets with one end sticking out of the top of the burn chamber. Then I pile some twigs on top of the napkin which is sitting on top of the pellets. I light the top of the napkin that is sticking out, the napkin takes the flame to the sticks, the sticks catch, then the pellets. It all works very nicely. Now I get a constant even burn for a full 25 to 30 minutes without having to throw any more fuel in. So now I have my BioLite burger grilling down to somewhat of a science: Start burn. Place burger on the grill. Go cut up tomatoes and onions. Open can of whole green chilies. At six minutes, flip burger. Prepare bun with ketchup and onions. Six minutes later, flip burger. Four minutes, flip again. In four more minutes, done. They come out just how I like them, about medium-well done. So yeah, I’m a big BioLite fan-boy. I’ve also outfitted my two sons each with a BioLite Camp Stove and the portable grill. It’s not only cool from a technical point of view, but fun and darn useful.